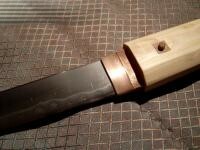 The blade furnished with the copper habaki is held in the handle using a bamboo pin. 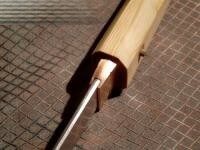 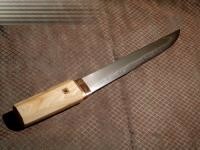 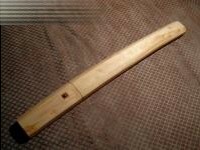 Tsuka of the shira saya wih bamboo insert around the hole. 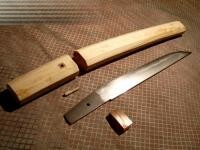 You can see the wood grain which shows, that this scabbard was not made from one piece cut lengthwise. 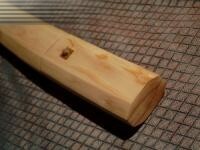 A detail shot of mekugi-ana, habaki and hamon. 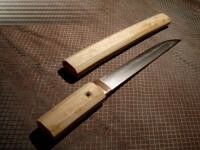 Here you can see the thickness of the habaki compared to the relatively thin (4mm) blade. 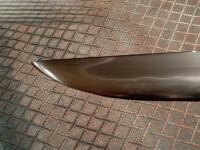 The hardened tip with boshi.